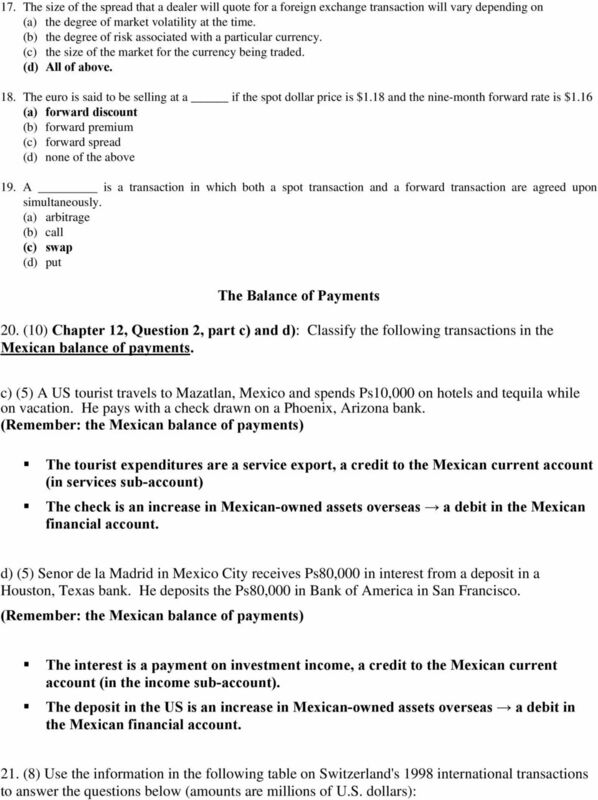 Download "Assignment 3 Answer Key (Maximum Points: 100) Multiple-Choice Questions Each question is worth 3 points. Explanation is not required." 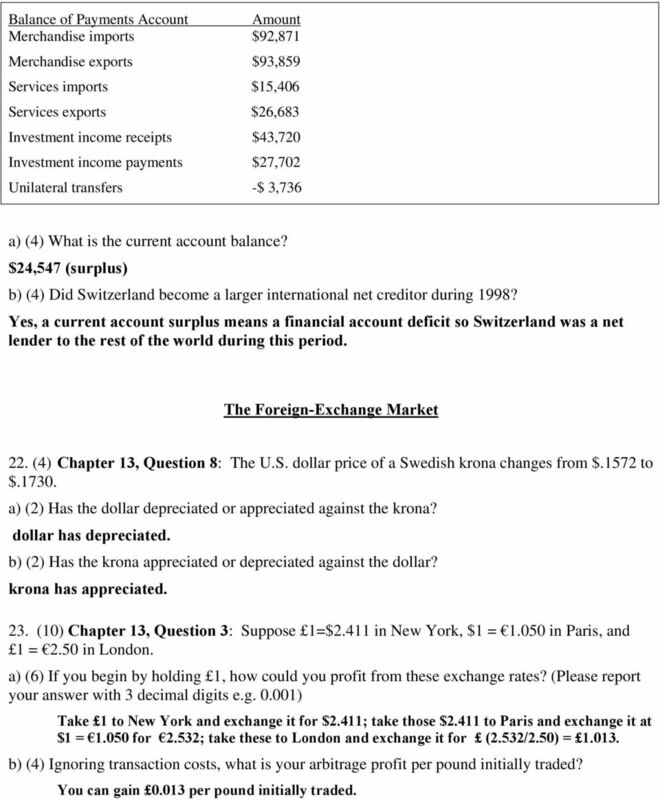 1 Econ 4401 International Economics University of Minnesota Deniz Cicek Fall 2009 Assignment 3 Answer Key (Maximum Points: 100) Multiple-Choice Questions Each question is worth 3 points. Explanation is not required. 1. The most commonly traded currency in the foreign exchange market is the (a) British pound. (b) Japanese yen. (c) Chinese yuan. (d) U.S. dollar. 2. The euro is now the official currency of all of the following countries except (a) France. (b) Slovenia. (c) Great Britain. (d) Spain. 3. A balance of trade deficit occurs when a country (a) exports more goods than it imports. (b) buys more goods from the rest of the world than it sells. (c) buys more stocks and bonds from the rest of the world than it sells. (d) both (b) and (c). 4. Which of the following transactions is a debit in the current account? (a) export of merchandise (b) export of services (c) gift to foreigners (d) foreign bond purchase 5. is necessary to "balance" the BOP statement. (a) Reserve inflow (b) Statistical discrepancy (c) Debit transaction (d) Credit transaction 6. In the BOP, travel and tourism are included in the category of (a) unilateral transfers. (b) financial account. (c) merchandise account. (d) services account. 7. Interest earned on foreign holdings of U.S. federal, state and local government debt are recorded in the (a) services account. (b) merchandise account. (c) transfers account. (d) financial account. 2 8. A current account surplus implies that (a) the country is a net lender with the rest of the world. (b) the country is running a net capital account surplus. (c) foreign investment in domestic securities is at very low levels. (d) All of the above. 9. Security purchases in the United States by foreigners is (a) a credit item in the current account. (b) a debit item in the financial account. (c) a credit item in the financial account. (d) a debit item in the current account. 10. Merchandise exports minus imports equal the (a) basic balance. (b) liquidity balance. (c) official settlements balance. (d) balance of trade. 11. The payment of a dividend by an American company to a foreign stockholder represents (a) a debit in the U.S. financial account. (b) a credit in the U.S. current account. (c) a credit in the U.S. official reserve account. (d) a debit in the U.S. current account. 12. According to the National Income Accounting Identity, the current account (surplus) is equal to (a) S-I (b) C+I+G+X (c) I+X (d) T-G 13. If the bank is selling euros for $0.89, then what is the implied euro price of the dollar? (a) 2.0 (b) (c) (d) Suppose in London /$ = 0.5 while in New York /SF =0.2. The corresponding cross rate (SF/$) is (a) 2.5. (b) 0.1. (c) 0.4. (d) Riskless transactions to take advantage of profit opportunities due to a price differential or a yield differential in excess of transaction costs are called (a) differential actions. (b) cash transactions. (c) arbitrage. (d) forward transactions. 16. The difference between bid (buying) rates and ask (selling) rates is called the (a) profit. (b) arbitrage. (c) spread. (d) forward transaction. 4 Balance of Payments Account Amount Merchandise imports $92,871 Merchandise exports $93,859 Services imports $15,406 Services exports $26,683 Investment income receipts $43,720 Investment income payments $27,702 Unilateral transfers -$ 3,736 a) (4) What is the current account balance? $24,547 (surplus) b) (4) Did Switzerland become a larger international net creditor during 1998? Yes, a current account surplus means a financial account deficit so Switzerland was a net lender to the rest of the world during this period. The Foreign-Exchange Market 22. (4) Chapter 13, Question 8: The U.S. dollar price of a Swedish krona changes from $.1572 to $ a) (2) Has the dollar depreciated or appreciated against the krona? dollar has depreciated. b) (2) Has the krona appreciated or depreciated against the dollar? krona has appreciated. 23. (10) Chapter 13, Question 3: Suppose 1=$2.411 in New York, $1 = in Paris, and 1 = 2.50 in London. a) (6) If you begin by holding 1, how could you profit from these exchange rates? (Please report your answer with 3 decimal digits e.g ) Take 1 to New York and exchange it for $2.411; take those $2.411 to Paris and exchange it at $1 = for 2.532; take these to London and exchange it for (2.532/2.50) = b) (4) Ignoring transaction costs, what is your arbitrage profit per pound initially traded? You can gain per pound initially traded. 5 24. (11) Show a graph of the exchange rate between the currency of your country of study against the U.S. dollar. If it is not available, you can show the exchange rate of any country of your choice against the U.S. dollar. Please follow the following instructions. Instructions: Go to On the right hand side, there is a list of currencies. Click on the name of the currency you want to report. Click on the value on the upper right hand corner of the table to see the graph of the exchange rate between the U.S. dollar against that currency for the last 120 days. Right hand click on the graph. Select Copy Image and then paste onto your assignment. 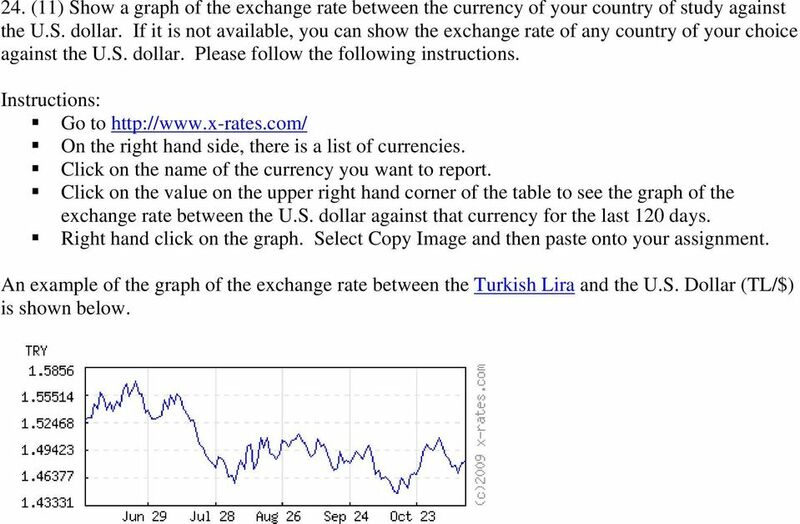 An example of the graph of the exchange rate between the Turkish Lira and the U.S. Dollar (TL/$) is shown below.